I found this picture yesterday from one of our classmate in Facebook. For sure, it was nothing when we signed our name, it was just a plain white shirt, maybe even a waste of time writing on it, but after 13 years of existence, its sure worth a lot of memory. Hey, he can even post it in ebay and I might even buy it. Thanks to Dudley for this nice idea and Enteng for posting in Facebook. And Yes, I am a proud graduate of Bachelor of Science in Information and Computer Science from the University of Cebu, Philippines Year 1997.
that was sweet. i wish i thought of that when i was younger. 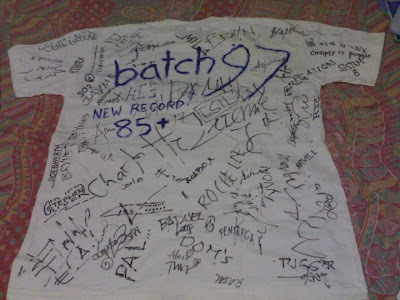 it would be very nice to see my former classmates' names ang signature after so many years..